The BRIT School for the Performing Arts & Technology in Croydon, London is singing the praises of Eurocell after we provided a very exacting architectural window solution. The school building was constructed in 1824 and is of significant architectural interest, as well as being notable for its famous students including Adele, Amy Winehouse, Jessie J, Leona Lewis and Katie Melua, amongst others. Eurocell and our approved-fabricator Dorwin worked together to incorporate an unprecedented level of bespoke features and specifications into the replacement windows. Addressing the client’s brief Eurocell profile system was used to manufacture a wide variety of window styles for BRIT School, including vertical sliding sash, arched, half moon, fixed lights, top hung and special shaped. Refurbishment of BRIT School was unusual because of the specific requirements of the client. 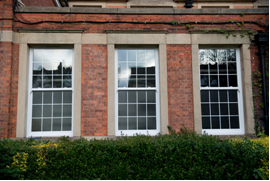 For example, bespoke vertical sliding sash windows had to be installed around the school’s staging area, which were specified white externally and black internally. White maintained the architectural integrity of the building’s exterior, whilst black ensures that the frames match the colour of the staging area backdrop. However, this couldn’t simply be a foiled black finish because the client had requested matt black – to match the matt colour of the stage. We working with our fabricator to identify a method of applying matt black acrylic paint directly to the profile instead. An additional benefit of this was that it created an extremely tough finish that was ideal for the rough and tumble of stage performances! Adding to the complexity on this project was a requirement for a number of large, elaborate Palladium style window arrangements to the front of the building. These comprised a large vertical sliding sash window centrally with two narrower sliding sashes each side. The Palladium style was completed with an arched fixed light above with two smaller quadrant windows each side. Another challenge was a Building Regulations requirement for half hour fire-rating on all windows to the front East wing of the school. Our fabricator Dorwin was able to work with our technical team and use its extensive experience and key supply partnerships to present the main contractor with a solution to take to the client. As with all architecturally significant buildings, attention to detail is critical, even when a feature is not always visible. This was the case with a 4.1m wide by 1.5m high half moon arched window which, although not visible from street level, still had to be manufactured using the Eurocell profile systems as a fully functioning window. Eurocell was able to satisfy the client’s brief for maintaining the original aesthetics of the BRIT School building. Shown here on the left is the original timber sliding sash window (showing signs of deterioration and a need for maintenance) and the new Eurocell sliding sash on the right. Eurocell is able to provide specifiers with a completely closed-loop recycling service on refurbishment projects – the recycled material is used to make new energy efficient window products that are often installed back into the properties from which they were removed. We are able to recycle around 20,000 tonnes of PVC-U each year and are unusual in that this is carried out in the UK, which minimizes the carbon footprint further. To learn more please call us on 0300 333 6525 or fill in our handy contact form below.